Together and Very Possibly Banging Again! Did She Call Drake an 'A-Hole' at the VMAs? Rihanna Did She Call Drake an 'A-Hole' at the VMAs? Rihanna -- Did She Call Drake an 'A-Hole' at the VMAs? Now, we're not professional lip-readers ... but we could SWEAR Rihanna referred to Drake and his posse as a bunch of "a**holes" when they won an MTV VMA award last night. Check out the video ... moments after Drake, Lil' Wayne, Nicki Minaj and the rest of the crew walk to the stage to accept the award for Best Hip-Hop Video ... the camera cuts to a close-up shot of Rihanna. 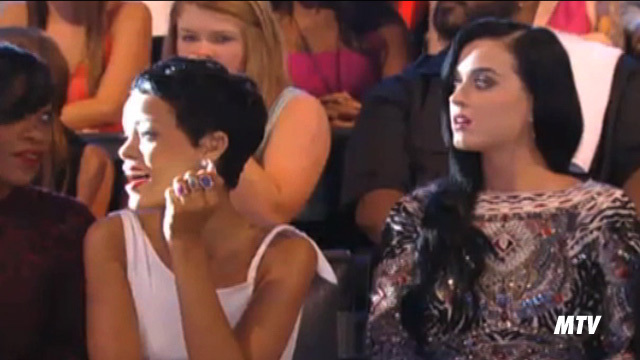 Rihanna mouths some words to the person sitting next to her ... it appears she says, "I hate these a**holes." Rihanna -- who was sitting just a few seats down from Drake -- also refused to clap for the rapper when they announced his name and even turned her head so she wouldn't have to look at him. No surprise since Rihanna is tight with Chris Brown ... whose face was busted up during that crazy NYC nightclub brawl back in June. Then again ... maybe she was just talking about "these rascals?"